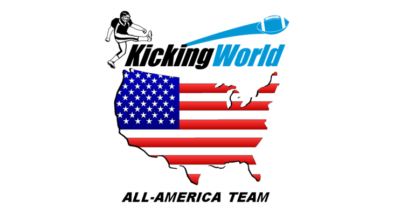 Coach Brent of Kicking World helps you understand how to choose the right kicking tee and when and why you use each field goal block and kickoff tee. Learn what we recommend as the best kicking tee. I shot this video to demystify the process of choosing the right kicking tee and also help debunk several ideas held by many high school kickers, their parents and coaches. Every week I get the question “What kickoff tee should I use?” or “What field goal block should I use?” Today’s video will answer these questions and go in-depth on why & when you should use a certain kicking tee. If you have any additional questions on selecting the right kicking tee simply post a comment below this post or add a comment to the YouTube video. We’re a big fan of the Under Armour kickoff tee which is designed by former NFL Kicker Shaun Suisham. The football stays on the kicking tee much longer in windy conditions; and allows for various tilts of the ball for different kickoff strategies such as long kickoffs, sky kicks, and onside kicks. The Ground Zero kickoff tee is also good and is one of the original modern kickoff tees. We do not recommend the old orange kickoff tees which are designed for toe-punchers / straight-on kickers, and we do not recommend the SKLZ kickoff tee and the ball falls over fast on windy days, and has too long of a front base which many kickers catch with their kickoff foot causing a loss of power. Check out my Amazon product recommendations for the most up to date kicking products you need to have in your arsenal.